Lumbar spinal stenosis treatment can vary greatly and the research has not been clear on what the best treatment options are. Even when the research appears to establish a proper protocol a new paper comes along and opinions sway once again. A recent paper published in the Annals of Internal Medicine, in my opinion, muddled the waters again in terms of the proper treatment of lumbar spinal stenosis. 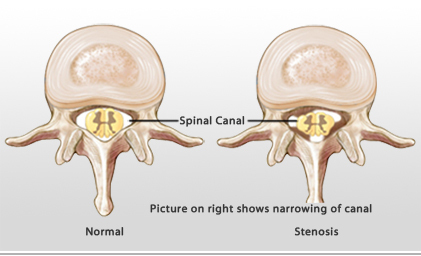 Lumbar spinal stenosis is a condition of the low back in which the central spinal canal narrows and pressure in this space is increased and can impinge on the spinal cord and nerve roots. In mild cases lumbar spinal stenosis can cause back pain, intermittent tinging in the lower extremities, and weakness in the legs. In more severe cases people can have persistent numbness in the lower legs, a loss of function in the lower extremity like the inability to pick your toe up while walking, or even a disruption of bowel and bladder control. The more severe cases of lumbar spinal stenosis are rare, at least in our office, and typically require immediate surgical intervention. The mild cases typically respond well to conservative management. This current paper titled; Surgery Versus Nonsurgical Treatment of Lumbar Spinal Stenosis: A Randomized Trial was published online on April 6 ahead of the print publication. The authors compared surgical to nonsurgical therapy for the treatment of lumbar spinal stenosis. The authors concluded “Surgical decompression yielded similar effects to a PT regimen among patients with LSS who were surgical candidates.” The authors assigned 87 pattens to surgery and 82 to therapy with half of those assigned to PT crossing over to surgery. From this study we can understand that in most cases of lumbar spinal stenosis that conservative management should be the first line treatment, not surgery. Surgery should be resigned as a first line treatment in only the most severe cases of progressively worsening neurological deficits. This is not a chiropractic paper so what implication might it have on our practice and procedures? Our care includes a combination of spinal adjusting and therapy aimed at supporting the spine and improving posture. We know that our methods can help people with lumbar spinal stenosis because we have seen them in our office and helped them but also because there are limited published studies showing chiropractic care can successfully treat lumbar spinal stenosis. We argue that by doing more therapy than to just reduce symptoms but to restore posture our care has better long term outcomes than standard chiropractic or standard PT. Since this paper compared surgery to PT and we know we can get better long term results than PT our care could be considered superior to surgery as well. Finally, since we know that chiropractic care is cheaper than surgery and gets the same or better results than PT or surgery there is really no better option to at least start with than chiropractic. If we let the research be our guide it is easy to see that chiropractic care, like ours, which includes restoring posture and the normal curves to the spine is the superior treatment option in cases of lumbar spinal stenosis. If you desire to know more, give us a call anytime we would be happy to discuss spinal stenosis and the relevant research further with you.